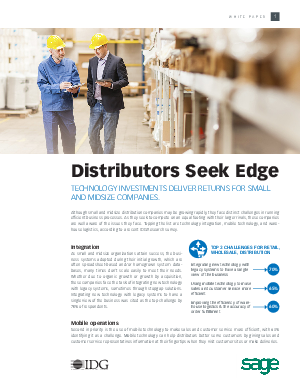 Although small and midsize distribution companies may be growing rapidly, they face distinct challenges in running efficient business processes. As they seek to compete on an equal footing with their larger rivals, these companies are well aware of the issues they face. Topping the list are technology integration, mobile technology, and warehouse logistics, according to a recent IDG Research survey. Download this research survey to learn more about the returns of technology investments for small and midsize companies.